Invest in your business, your brand and yourself. 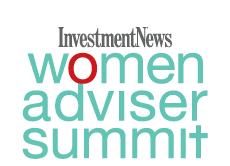 The InvestmentNews Women Adviser Summit, a one-day workshop now held in four cities due to popular demand, is uniquely designed for the sophisticated female adviser who wants to take her personal and professional self to the next level. Use Code FPA to receive $80 off the registration fee. * We have a limited room block reserved at The Colonnade Hotel under InvestmentNews. The rate is $299 per night. Call the hotel and mention “InvestmentNews” to book your reservation.